NUDURA Insulation Technology can be directly applied on foundation or exterior walls allowing you to frame and insulate basements or exterior walls above grade in one easy step. With the standard 4 ft x 8 ft dimension and shiplap edges, installation is fast, saving time and money compared to multi-step finishing processes that are far more labour intensive. With NUDURA Insulation Technology, simply attach the insulation board to the foundation walls with a foam adhesive and/or screws, run your electrical and then drywall. 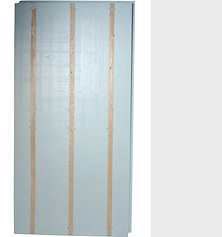 Drywall can be easily attached directly to the embedded 2 ½” fastening strip positioned on 16” centres. A vapour barrier is not required. • Available in 4ft x 8ft sheets and in thicknesses of 2 ½” and 3 ½”. the equivalent of a wood frame wall insulated with R19 batt insulation. requirements making installation easy for contractors and homeowners. • Provides increased home comfort. • Save energy by eliminating thermal bridging. • Reduced opportunity for mould growth. • No place for condensation to form. any CFC’s or HCFC’s, or produce any off-gassing. Easily attach NUDURA Insulation Technology using mechanical fasteners (screws or concrete nails) and an EPS compatible adhesive. Panels easily fit together with the ship lap system creating a solid thermal barrier. Electrical wires are easily inserted into NUDURA Insulation Technology using a thin bladed knife, eliminating labour intensive wire installation found in traditional finishing methods. Install drywall by fastening with standard drywall screws to the fastening strips that are provided every 16” on centre.